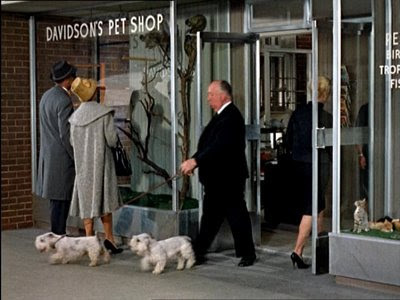 In his cameo for The Birds, Hitch walks Geoffrey and Stanley out of a shop as star 'Tippi' Hedren walks in. If you've seen The Birds, you've seen Alfred Hitchcock's favorite pooch: his beloved Sealyham Terriers. According the London Independent, they're now a dying breed. At the height of their popularity, upwards of 1,000 Sealyham puppies were registered with the Kennel Club; last year that number plunged to just 43. If this trend continues, the dog once preferred by my parents' and grandparents' generation may disappear. 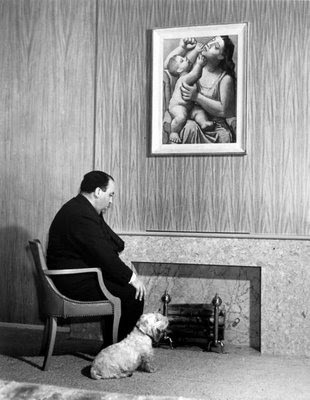 Hitch contemplates the future of dog breeding with his first Sealyham, Mr. Jenkins. It seems they pudgy, short-legged pooches have fallen victim to the winds of fashion. Though once favored by such Hollywood luminaries as Cary Grant, Humphrey Bogart and Elizabeth Taylor, glamsetters now favor smaller dogs, such as Chihuahuas and Shih-tzus. Exeunt, Sealyham, stage left.